...I perceived in the distance a cylindrical revolving cloud...travelling...at high speed...I hurried indoors to warn my wife. I told her that had we been anywhere other than in England I should say that we were in for a tornado. On the late afternoon of Sunday, May 21, 1950, thunderstorms broke out over Buckinghamshire, Bedfordshire, and the Chiltern Hills. The storm clouds probably rose to a height of at least 35,000 feet. Two persons and several cattle were killed by lightning. Intense rain caused flooding in several counties; traffic on the Great North Road was held up, and the road at Oakley in Bedfordshire was blocked by over a foot of hail. Hailstones broke windows, wrecked greenhouses, damaged crops and killed poultry. In parts of Bedfordshire, leaf-shaped hailstones fell, made up of 20 or 30 small stones frozen together. Between 2.30 and 4 p.m. several observers in Buckinghamshire reported rotation in the intensely dark base of a thunderstorm cloud. Just before 4 p.m., the cloud formed a tornado, which touched down in the Missenden-Wendover valley, and began uprooting trees. Here it was about 50 yards wide, moving north at 30 miles per hour. It soon changed direction to the north-east and increased in strength. Many mature trees were uprooted and thrown in all directions, although the tornado only lifted some tiles as it passed over the town of Wendover. The main tornado approaching Halton RAF camp. 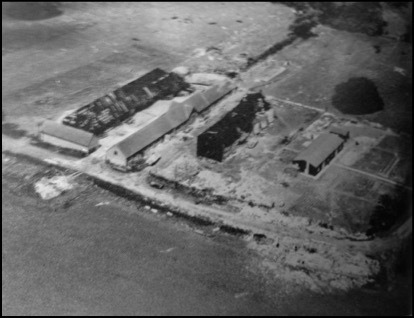 Many persons saw the tornado as it bore down on the Royal Air Force camp at Halton, and its photograph was taken. The funnel resembled 'a giant palm tree', lifting objects and throwing them out about 300 feet up. A power station's roof was lifted off. As the funnel passed over an avenue of trees, it seemed to break up, although a dust whirl on the ground continued for several hundred yards. The tornado lifted and touched down again several times between Wendover and Leighton Buzzard. The funnel was aloft as it approached Aston Clinton, but then lowered and severely damaged trees and buildings, before lifting. It touched down again at Puttenham. A Nissen hut was destroyed, and its floor left 50 feet up in a tree. The tornado's path was becoming erratic. It zigzagged again in a tortuous course, felling trees and lifting farm vehicles. The tornado was 'skipping', lifting off the ground and descending again, with a funnel still visible when it was aloft. A distant observer saw the funnel as 'three or four twisting columns,' which united as the tornado approached Linslade amid heavy rain, thunder and lightning. Damage here was severe. Houses were unroofed and outbuildings wrecked. 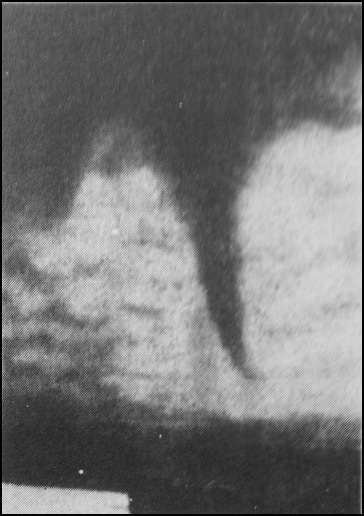 Intense darkness, "darker...than ever known in the hours of daylight", spread over the Bedford area as the tornado and its parent thunderstorm approached. Only one or two people saw the funnel, yet large trees were carried across the River Ouse or were dropped into the river. The tornado was still 'skipping', something it would continue to do along the rest of its path. Near Sutton in the Fenland, the driver of an Eastern Counties double-decker bus saw the tops of trees being torn off just before his bus was toppled. It fell onto grass and received only minor damage. The 14 passengers were shaken, and one was injured. The bus driver was unhurt, though the conductor was knocked unconscious. In Norfolk, Feltwell Aerodrome reported "dozens of twisting vortices" beneath the thundercloud base. At Runhall, E. Quinton Bitton saw the storm approaching from the west. Just below the storm cloud was another cloud, a revolving horizontal ’attenuated wind stocking’, preceded by a sudden cold wind. When he looked again a few minutes later, the cloud had ‘disappeared in mid-air.’ Another funnel was seen later, but did not reach the ground. It withdrew into its parent cloud as it passed over the North Sea near Blakeney in Norfolk at 8 p.m.
At Sheringham, also in Norfolk, a weather recorder, T. E. Ormond, saw a ‘peculiar cloud formation’ preceding the dark mass of the approaching storm. “A long white cloud appeared to be pushed along by the dark clouds of the storm centre”. The temperature rose 8 degrees to 60º F., and in a few minutes heavy rain and hail fell, with a vivid lightning display as the storm passed out to sea. A third tornado was seen at Caldecote, Bedfordshire, about 5.30 p.m. This was a relatively minor funnel, lifting shed roofs and breaking tree branches. The track was only about five yards wide and a quarter of a mile long. Tornadoes in East Anglia, 21 May 1950. The symbols do not denote individual tornadoes. The track of the main tornado, as mapped by the pioneer investigator H. H. Lamb, was 65 miles long, certainly the longest track recorded in the British Isles. The funnel often left the ground before touching down again, and the current opinion is that most long-track tornadoes are actually tornado 'families'. The 'skip-distances' marked where one tornado dissipated and a new one formed; in which case there may have been as many as seven tornadoes. However, on May 21, a funnel was often seen aloft even over the areas where there was no damage. 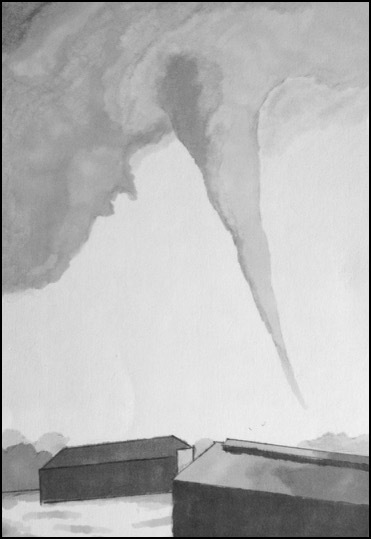 The tornadoes caused no human fatalities, according to H. H. Lamb's report; but a contemporary newspaper account says that an eight-year old girl, Jennifer Reeves, of Podington, (Bedfordshire) was drowned "when the tornado, pushing a wall of water before it", hurled the truck she was in 100 yards before the vehicle vanished in the flood. Two cows and much poultry were killed by whirling debris. A cat caught in the vortex of the main tornado at Linslade was seen flying through the air, but it may have landed safely. At Linslade, repair crews and firemen had immediately begun work on 50 roofless houses, removing tottering chimneys and dangerous beams. 450 tarpaulins, rushed to the spot by the Ministry of Supply, were put into place, and by noon on Monday all but six families were able to return to their homes.